Adams Golf built its name on a golf club, the Tight Lies, that helped the average golfer get the ball in the air out of tough spots. They carried that through to their hybrids, and into their Idea Tech hybrid iron set. 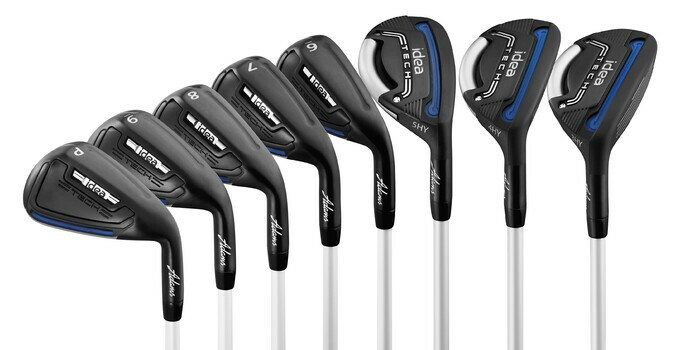 The latest generation of the Idea irons really dials in on the group of golfers perfect for these irons: players with slower swing speeds who need help getting the ball in the air and through contact, down the target line. The clubs were designed with a 24-gram weight added to the back of 3-5 hybrids, moving the center of gravity millimeters lower and further back, helping with lift and spin. The remaining clubs in the set (6-PW) feature what the company calls a Ghost Slot Technology, introduced in the last generation of Idea. There's a slot stretching the bottom front of the club's sole and another barbell-shaped slot on the crown. As we've seen in other clubs, the combination works together to improve energy transfer at impact. The Idea set also boasts a new progressive shaft design, meaning the shaft tip diameter get thins towards the lower end of the set, taking away weight and add swing speed to improve the chances of a more ideal launch angle. The Adams Golf Idea Tech hybrid irons are now available, starting at $800 for men's steel and $900 for graphite-shafted clubs for men, women and seniors.